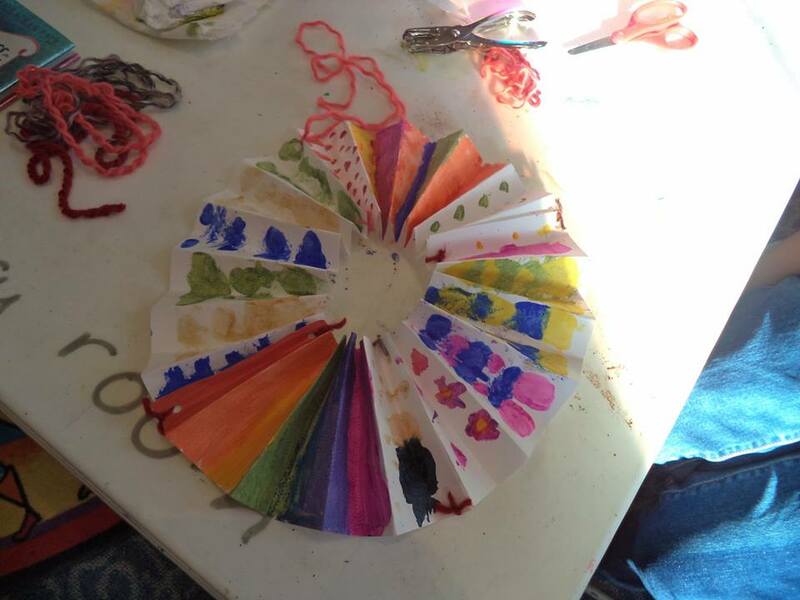 This week at the library; or, I'm not at the library! VACATION but library life goes on without me. No programs. I hope the gerbils are still alive. 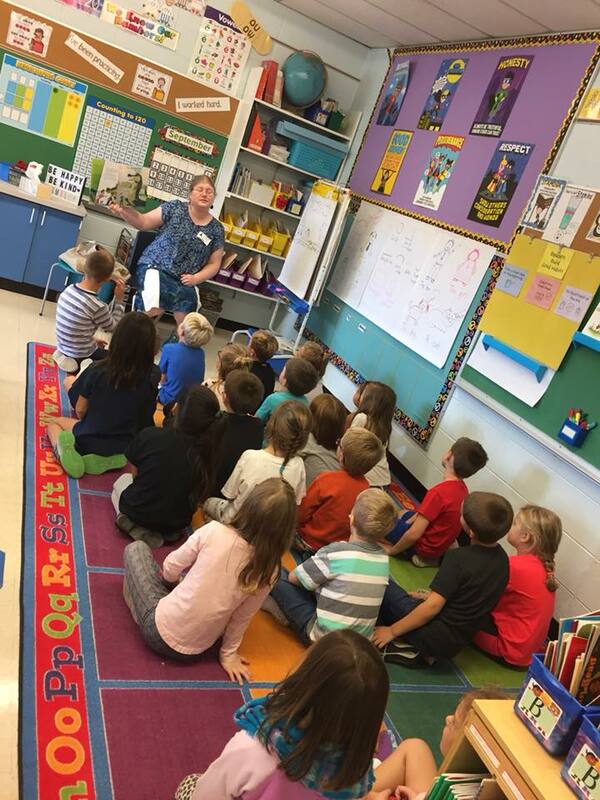 My associate is doing their first solo outreach storytimes! This colorful graphic novel weaves a lot of threads about bullying, diversity, consumerism, and recycling into a fun fantasy story. In the Chasma valley, knights of different chemical properties "catalyze" or activate toys. When the toys break, they get new ones. But Neon Knights can't do anything - or can they? Neon Knight Beryl, despite the overt bullying of the Sulfur Knights and the disdain of everyone else in the valley, is determined to be a great toy maker, not just a consumer (since she can't actually catalyze anything anyways). When Beryl meets the powerful but clumsy Coro, an Oxygen Knight, the two warily work together. But when things go wrong, will their incipient friendship - and Beryl's hard work - be destroyed? Puffy, pastel illustrations show a delightful, cotton candy-like world. Despite the cute characters, toys, and colors though, there's a lot of prejudice and meanness in this little fantasy and it will take all the hard work and goodwill of the two characters to overcome their differences and prejudices. Kids can read this for the cute toys, fun adventures, and making/science aspects; however, it could also spark discussions about prejudice, consumerism, and how we use resources. Readers can compare the blatant hostility of the Sulfur Knights to Coro's ignorant comments and casual prejudice towards Beryl and discuss their own privilege and experiences. Verdict: A wide range of readers will enjoy this cute and quirky graphic novel; hand it to readers who are fans of El Deafo, 5 Worlds, and all things cute and comic-related. Bob did not want to go to school in space, but here he is, with an alien/robot friend called Beep no less! Space is not fun. Space is big and scary and dark! And his teachers are absolutely nuts (my assessment). Bob has to deal with bullies, nutty teachers who take him and his classmates on field trips to deadly planets and black holes, and worst of all, huge spiders! Will he ever make a friend besides Beep? (who totally doesn't get how crazy and dangerous this all is!) and if he does make a friend, will he have to *gulp* like her spiders too? Goofy black and white cartoons decorate the story, showing the hapless Bob, relentlessly cheerful Beep and a handful of their kooky classmates. Some space facts are included at the end, as well as a sneak peek at the next book in the series. As an adult, I was both skeptical and mildly annoyed at the insanely dangerous things the adults do with the kids - cheerfully telling them there will be a test later, if they survive! But kids will love the goofy humor of this, especially if they're into science fiction. There are very, very few science fiction stories for this age group and it's nice to see a more realistic diversity in the kids shown - Bob has tanned skin on the cover and stylistic curls, Lani has dark hair and shaded skin that looks as though it might be darker. The bully and all adults shown are white. Verdict: Hand this to fans of Space Taxi and Alien Agent, but unless you have really rabid space fans I wouldn't say this was a necessary purchase. I can't explain why, but for some reason I was absolutely sure when I saw this latest book in this easy reader series that the illustrator had changed. I have no idea why. Weird. Anyways, Mo, the dark-skinned sports enthusiast of the previous books, has returned. He has a big soccer game coming up and is determined to practice his kicks. His parents aren't quite so thrilled, especially when he practices inside, but they take him outdoors to work on his technique. Mo needs a lot of work; he's got enthusiasm and determination, but not much else. Out on the field, he's the smallest of his team, which includes a range of skin tones and genders, as well as one girl in a head scarf. They're up against a bigger, but equally diverse team. Their coach, a black woman, reminds them how to kick and the game begins. Mo is soon tired out from chasing the ball, but when he finally gets a chance to kick it, will he mess up again? The simple illustrations show a diverse, both in visible race and size, group of kids facing off against an equally diverse but generally bigger team. The backgrounds are mostly simple grass green and blue sky, keeping the emphasis on the words. Text is shown primarily on light blue sky or white background. The text is simple and repetitive, listed as a level I. Verdict: There are no other easy readers (that I can think of at the moment) that feature real kids playing sports, so this is a must-have for your library section. It will be interesting to see if Mo continues his way through less well-known sports (hockey? lacrosse?) now that he's done the big four. Bear, a large purple-brown rectangle with staring eyes, is definitely a neatnik. He likes everything just so and he doesn't like sharing his space with anyone except his stuffed toy, Ursa. When Bear finds a spider web... and then another... and another, he freaks out! He goes on a cleaning tear, searching for the spider he is sure is causing rampant destruction in his house. Meanwhile, the spider is quietly pursuing her own business. When Bear's panic causes him to damage his beloved toy, can anyone help him fix Ursa? Muted colors and bold, broadly drawn shapes remind me of Chris Haughton's artwork, but this has a distinctive, almost modernist flair. Lots of pink and orange hues, and a tidy little spider with a button beret and an affinity for knitting add charm to this story about making new friends - and being flexible. While I dislike many of the books that suggest solitary and/or introverted characters should change to accommodate their livelier "friends", I didn't get that feel from this at all. While the spider did leave a few webs about, most of the mess comes from Bear's panicked brain and when he slows down a little, he realizes the spider is just like him, enjoying a quiet life, books, and music. The spider also contributes, mending Bear's friend Ursa, instead of their contribution being to "improve" Bear's life by making him change his personality. Verdict: This quiet story will make children chuckle and adults take a moment to think about how they help children with different personalities interact - as well as remind people to appreciate spiders! Yes, I am aware it is no longer Shark Week or anywhere in the vicinity thereof. But really, shouldn't we celebrate sharks all the time? Yes, yes, we should (although I personally am more of a hyena fan). What could be better for young shark fans than National Geographic shark books, full of exciting pictures, interesting facts, and real-life shark encounters? Not much! The Ultimate Book of Sharks was created primarily with the photographs of Brian Skerry and the text is scattered with his own experiences, encounters, and quotes regarding sharks. The bulk of the book is divided up into the facts that National Geographic does so well. There are chapters on the unique anatomy of sharks, well-known sharks like the great white and the hammerhead and lesser-known, smaller sharks, and more prolific sharks. A chapter on shark myths addresses the dreaded shark attack, another covers the fascinating world of prehistoric sharks and their fossils. The last two chapters address the superlatives - the biggest, fastest, smallest, deepest, and more and the plight of sharks in the world today and how kids can be involved in helping them. Back matter includes an index, credits, and acknowledgements. I also received a paperback copy of Face to Face with sharks. The Face to Face with... series was originally published several years ago but is being republished in paperback. To the best of my knowledge, this is just a new printing; the books are not being updated. However, they are aimed at a slightly younger audience, with larger, simpler text and as such include few things like dates or specific current research that would become outdated. This series covers the basic facts about sharks' anatomy and behavior and their conservation. There is no table of contents, but there is a glossary, questions, find out more and a few other back matter elements. Verdict: For all your shark fans, The Ultimate Book of Sharks is a must-have. It's full of interesting facts and photos, personal encounters, and is sure to interest kids whether they read straight through or dip in and browse. I really like the Face to Face series, but I rarely purchase popular nonfiction, like animals, in paperback so this probably isn't one I'd use on the shelf. However, if you purchase paperback nonfiction it's a great opportunity to get new copies of this popular series. I had a dentist appointment on Monday. That pretty much characterizes the week with an extra side of plugged toilets. Next week, vacation! I was skeptical when I received this - so many "global" mythology or history books are anything but. However, this encyclopedia truly includes a wide range of mythology, as well as amusing pictures, and a voice that's both light-hearted and respectful of various traditions. An introduction talks about the origin of myths and how they are researched - and how little we sometimes know. There's a legend of designs that show what tradition the characters come from, as well as markers for gods, heroes, and creatures. There's also a quick glossary. Back matter includes an index by type (god, goddess, etc.) and by tradition (Slavic, Sumerian, etc.) and a map. The entries' content varies. Some retell stories of the various characters, some include research into the myth, others include how it affected the tradition or religion. Some sample stories include Hera's revenge on Semele and Io, Kintu's trip to heaven for a wife, and Nu Gua rides a gourd. Greek/Roman mythology has 10 entries, Indian/Hindu, Egyptian, and Norse each have 8, China has 6. Other traditions included are the Americas, including North American Great Plains, Inuit, Inca, and Mesoamerican, Japanese/Shinto, Sumerican/Mesopotamian, Australian, Maori, Persian, West African, and Slavic. The art fits in well with the tone of the stories; respectful but humorous. The characters are shown with the appropriate color of skin, artifacts, and against their native background. While the author glosses over some of the more egregiously sexual and violent aspects of the myths and throws in humorous pop-culture references, he does so in a way that feels to me like he's taking the myths seriously as a part of the various cultures and not using them to titilate or shock. One reviewer mentioned the complete lack of Judeo-Christian characters and I.... actually prefer that. Whether you consider that tradition to be mythological or not, in my community an encyclopedia that treated them as mythological would be extremely controversial, especially if directed towards children. Not to mention, it would have made the book waaaay too long. Verdict: A great choice to get kids into exploring different mythologies; recommend to mythology and comic fans. Humphrey is back in a special birthday surprise. Along with his new friend, Og the Frog, Humphrey is excited about the upcoming birthday party for student Kirk. He's really excited when he gets to go along! As the kids discuss Kirk's birthday celebration in the classroom and his upcoming party at home on Saturday, some of them notice that some birthdays are missing - Humphrey's, Og's, and Mrs. Brisbane's. Humphrey thoroughly enjoys Kirk's backwards birthday bash and even puts on a show for the kids. When he gets back to class, he tells Og all about it (even though they can't understand each other) and the two of them cook up a surprise for Mrs. Brisbane. But who will get the surprise in the end? This is the eighth book in the series "Humphrey's Tiny Tales" an easier version of the popular "The World According to Humphrey" series which is now being extended with a new chapter book series starring the Og the Frog. I have really, really tried with these books and I'm just going to say it - I find them unutterably boring. They're just so.... bland. There are no real conflicts, no real plot, and the students are all reduced to stereotypes like "Please-don't-complain-Mandy-Payne". The introduction of Og the Frog is just exasperating - if Humphrey and Og can both understand the students, why on earth can't they understand each other? Verdict: The line drawings are cute and these do have a steady, if not wildly enthusiastic audience, but they're definitely filler books. I really liked Tabor's Fox picture books, although some of the plot lines felt a little weak. Turns out, they translate really well into easy readers and I can't wait to add this set to my library! Fox tries out what it's like to be somebody else in Fox the Tiger. A tiger book with a looooong fold-out page makes him think it must be cool to be a tiger and with a little black paint he gets to try out his wish! After all, tigers are the best - they are big, fast, and sneaky! When the other animals see Fox the Tiger out on the prowl, they get into the fun with Turtle becoming Race Car, Rabbit becoming Robot, and so on. But when the rain washes away their disguises, how will Fox feel about being Fox again? The cheerfully colored illustrations are set against generous white space with lots of textured greens, oranges, and soft blues. This title comes in at a reading level of E, which is a nice intermediate level and kids will appreciate the humor and relative comparisons in the book as Fox realizes that while he admires tigers, somebody else might think he is the coolest! Fox is late shows Fox's more mischievous side. He's late for a mysterious event and as he races to his destination he acquires a team of enraged animals. He's flipped his skateboard over Rabbit, used Turtle as a ramp, done a nose slide on Elephant, and so on. The animals finally catch up to Fox at his house - where it turns out he was late for the lunch he was fixing for his friends! All ends happily around the table. There are concept words and multiple repeated sentence with one additional word, for example, "Fox gets food. Fox gets fast food." The simpler text brings this in at a level D and it's a good introduction to the character's sly humor and naughty personality. Verdict: This is a fun new series to add to your easy readers. With a light amount of humor, attractive illustrations, and a memorable character, it's sure to attract young readers. Square, pink, pig-tailed Eraser is always cleaning things up. Her hard work isn't appreciated by Pencil, who takes credit for the things she fixes, or the other drawing and writing implements. She and her friends, Ruler and Pencil Sharpener, are left out of the games that Glue, Tape, and all the other "creative" implements play. When everyone leaves her out of a meeting, because it's for creators only, she determines to change the game and make her own creation. But things don't go so well and after Pencil's mean comments, she decides to leave. Once off the desk, she discovers a whole other world - and realizes that she does create something - second chances! When she returns, she finds the other desk-dwellers, including Pencil, have realized how much they need her too. A wiser (and shorter) Pencil apologizes and working together they get an A+ on their project! There's no more division and Eraser forgives Pencil and invites him to join the whole group at lunch. Weyant, who has partnered with Kang on a whole series of clever books that explore concepts like relative size as well as emotional intelligence, brings his humor and cartoon art to mix with Kang's silly puns and heartfelt story. 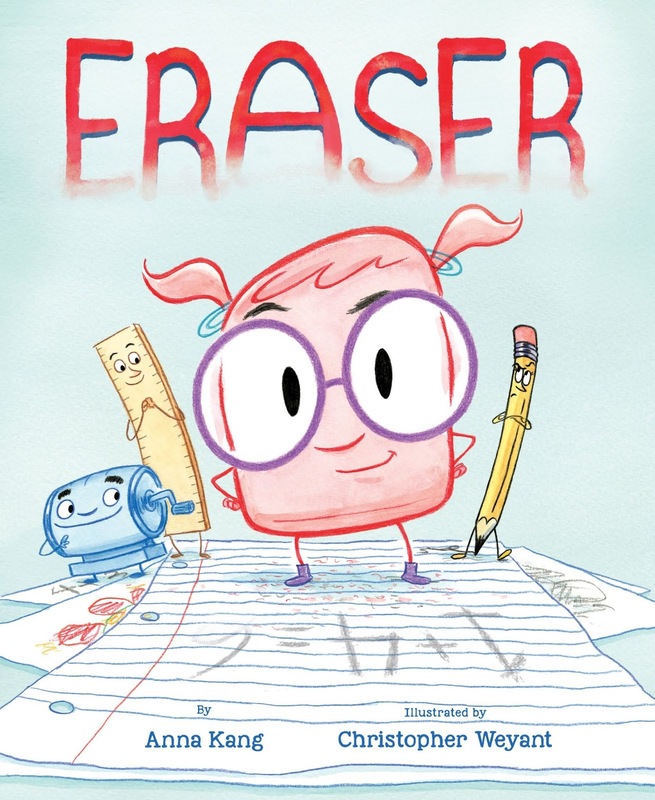 Eraser is chunky and pink with big purple glasses, pigtails and a hint of bangs, skinny pink arms, and a wide smile that dims as she's continually left out. She's appropriately grubby from all her hard work. Pencil shows his supercilious character with haughty eyes and mean quirks of the eyebrows, but once he's been ground down a bit he's much more subdued. Many tiny details add humor to the story; when she leaves the desk, Eraser packs her luggage (including extra paperclips for her hair) in a mint tin. Tape and Glue decorate all their friends with pipe cleaners and buttons, joining together for a rousing rendition of kumbaya and prompting Eraser to sigh that they can "get anyone to stick together." With bright, clean colors, a humorous story, and a strong message of cooperation, appreciation for everyone's efforts, fixing mistakes, and trying again, this is sure to be a hit both in storytime and in the classroom. 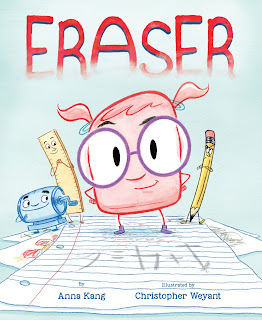 There's a great event kit available at the author's website and I'm thinking this would make a great lesson plan for our storytimes and charter school, paired with some other writing books, encouraging kids to create - and erase, draft, and sketch - their own stories. I'll post a lesson plan for that here when I get it put together! Verdict: Sure to be as popular as Kang and Weyant's other titles, this upbeat story about working together and getting a second chance is a great addition to any school or library collection. Recommended. I'm going to be honest - I did not like this book. I expected to like it, I requested it to review, and I wanted to put it down within the first couple pages. Your mileage may vary. After a quick list of safety tips, the book jumps into the history of food. The chapters cover the prehistoric era, ancient Egypt, Greece, and Rome, medieval times (England and a little Europe), Mongols and the Silk Road, Renaissance (Florence and a little Europe), American Revolution, French Revolution, Industrial Revolution (England), World War I (USA and a little England), Great Depression (USA), World War II (USA), the sixties (America), and a future imagined life on Mars. Each chapter starts with a one and a half page "bite-size history" giving a general overview of the time period. The chapter also includes a number of features - A day in the life, featuring a common or lower-class person, Spicing things up, which has additional facts, Menus of the rich and famished, focusing on what the upper classes and wealthy people ate, Yucky habits of yore, and other statistics and factoids. Each chapter ends with two recipes adapted from the time period and a "Popcorny" quiz that reviews the chapter. There are lots of photographs, cartoons, photoshopped animals waving spoons and wearing chef hats, quotes from kids who tried the recipes, and more. So what's not to like? Well, did you notice the distribution of geographical areas covered? It's really a history of Western (primarily British) white people through the ages, not of the world. There are a lot of facts and information glossed over and left out, like the continents of Africa and South America for starters. There are only a few brief sentences mentioning the contributions of Native Americans and African slave labor to the food we eat today, not to mention Mexican influences. There's no mention at all of the Caribbean sugar trade and accompanying slave trade. The chapter on the Great Depression doesn't mention African-Americans or Latinos at all and the opening cartoon shows a black man serving a white man and boy at a bread line. I'm.... really, really skeptical that would have happened? The review of Roosevelt's New Deal and how it revived the economy leaves out completely the fact that it mostly was open only to whites. The chapter on the sixties has space to mention the new trend of vegetarianism, but not a single mention of migrant crop workers and the work of Cesar Chavez and Dolores Huerta. Finally, the "Yucky Habits of Yore" fact blips were blatantly prejudiced. The first one, in the prehistoric age, says "Early humans ate what was available, including insects! Mmm...cicadas?" Completely ignoring the fact that many cultures today eat bugs and insects, it's purely a cultural thing whether or not you find it gross, and implying that said cultures are primitive early humans is just... I have no words. In the chapter on the Mongols, this same section lists the following as yucky facts "In the 1230s, the Mongols built a fountain that spouted fermented mare's milk. ; Mongol soldiers might drink their horses' blood or milk if they were thirsty. ; The Mongols believed animals had to be killed in the shadows so the sun wouldn't see it happen. They didn't want the earth to know about the sacrifice either, so they made sure not to spill blood on the ground." The other "yucky habits" are things like the Romans cleaning plates with urine, colonial people pooping at the dinner table, or kids in factories having to eat dirt that got on their food. Hmm, interesting that the only cultural practises described as "gross" were those of non-white, non-Western peoples and ones that are still in use today. This could have been interesting. The author had a lot of fun facts and National Geographic does a great layout. But it didn't live up the hype and the overlooking of major historical events, the experiences and contributions of non-white, non-westerners, and poking fun at other cultures was extremely off-putting. Verdict: I don't recommend this book. I don't even want to think about Monday. It was both extremely busy and extremely...weird. I had a disappointingly small turnout for book club and we had to postpone anime club to next week. The parking lot is not yet done, I have several huge projects on hand, and I am just tired. I went home early on Friday to listen to webinars, organize grants, and lay out the long-term plan for the children's area. Sandra Markle introduces her latest wildlife investigation with a startling discovery in 2013; snowy owls in... Maryland? Why were snowy owls, an Arctic bird that rarely migrate south, suddenly showing up in large numbers in Canada and all down the east coast of North America? To solve the mystery, Markle takes readers through the life cycle of the snowy owl, from breeding season to the importance of lemmings. The snowy owl irruption (an unusual migration pattern) had no definite cause, but various scientists advance different theories such as an unusually large amount of lemmings resulting in a larger number of snowy owl hatchlings surviving and causing increased competition. Heavy winds and storms were another possible cause. Whatever the reason, the snowy owl irruption of 2013/2014 gave researchers an unprecedented opportunity to study these usually elusive predators, but the snowy owls' arrival in new hunting grounds also caused problems, both with local animals and humans. One snowy owl in particular, given a transmitter during the irruption, added a great deal of knowledge about snowies due to its extensive round-trip migrations, stretching all the way down to Maryland and back to the Arctic. A final chapter discusses the future of snowy owls, the possible impact of climate change, and more of the discoveries made due to the irruption. Back matter includes an author's note, discussing how the Markle worked with scientists, notes, glossary, additional resources, and index. Verdict: For readers not yet ready to tackle the more demanding Scientists in the Field titles, Sandra Markle's excellent nonfiction investigations, many framed as mysteries, offer a tantalizing look at real scientific research as well as interesting stories about animals. The large format of the books, which allows for the break-up of text with photographs and additional information, may discourage some close-minded teachers, librarians, and parents, who see them as "picture books" but they will be doing their students and readers a great disservice. Recommend this to kids interested in science, animals, and those who need samples of how research works. There are a lot of picture books that set out to be cute but end up just being creepy, mainly featuring animals or kids basically stalking or harassing others under the name of “crushes” or “cuteness”. I was very impressed then that Betton manages to write a sweet, gentle book about physical affection while still respecting personal boundaries and sending a clear message of consent. Hedgehog wakes up on day feeling very blue. He’s sure he’ll feel better if only he can get a hug, so he sets out to find one. He asks Rabbit, but she’s got a cold and scampers into her burrow. Raccoon pleads garbage breath and disappears into his log; Turtle doesn’t even wake up. Fox is the only one willing to give him a huge, but she’s got an ulterior motive - and Hedgehog doesn’t feel bad about giving her a mouthful of spikes, even if he’s still blue and longing for a hug. Finally, Hedgehog meets a friend who also wants a hug: Skunk. Will he take a chance and give her a hug? Hedgehog is careful to ask permission of every creature, and even though he’s sad and disappointed that they won’t give him a hug, he doesn’t get mad or blame them for being afraid of his prickles. He doesn’t accept a hug from Fox, no matter how much he wants one, because he knows she doesn’t really care about him, she just wants to eat him! Verdict: A truly lovely and beautifully written debut picture book. I look forward to many more titles from Betton and strongly recommend this one for use in storytimes or one-on-one reading. The science of poop seems to have been a popular theme in 2017 and of course it’s still garnering interest. Kids are interested in poop. This is just a thing. This latest book on the odoriferous subject combines humor and science to present the science of poop to the youngest readers. In rhyming text, the story starts out with a series of animals and their digestive remains. “Giraffe poop looks like marbles as it drops a long, long way./Panda poop is full of bamboo. Pandas eat and poop all day.” After showing the poop of a number of animals, from bats to penguins, sloths to lions, the book pauses for a full spread asking “So what do zoos do with all of that poo?” The second half of the picture book is dedicated to where all that poop goes. Zookeepers, scientists, truck drivers, and gardeners, all in a variety of races and genders, shovel, compost, recycle, and dispose of all that poop. The book ends on a humorous note, with monkeys tossing their poop at the reader. Each page, in addition to its simple, rhyming text in bold lettering has a longer paragraph in smaller text offering more information. So the main text reads “A wombat’s poo is cube-shaped, so it isn’t very roly.” While the longer text explains that wombats are territorial and how their droppings help them mark their territories. This is a format I have found very accessible to a wide range of audiences and readers and I’m always thrilled when I see the double levels of text like this. The art is created in bright, bold digital images. The wombat is a rich golden brown, surrounded by a frame of her own square poop and set against a grass-green background. The scene of the mailman delivering poop samples to the scientists looks almost like a scene from a Little Golden Book, with bright, sharp images and lots of square and round packages and containers. This is echoed in the round and square poop samples as well. One of my favorite images shows worms working their way through the ground in a cut-away, underground scene. The top has a bright blue sky and some stylized zucchini plants while the bottom shows a rich mixture of compost, with smiling pink worms working their way through their tunnels, leaving behind little, round brown poos. The only drawback is some confusion in the final scene. Indeterminate monkeys (with tails) are shown throwing poop and the additional paragraph explains that chimpanzees with the best-aimed poop are “the smartest and most sociable”, suggesting poop-throwing as a step towards using tools. Chimpanzees are apes, not monkeys, and don’t have tails. Also, I’m pretty sure they do use tools. Despite this quibble, it’s overall a well-researched and fun book, age-appropriate and not too gross despite its chosen subject. Verdict: A delightful and informative choice for a poop-themed storytime (go on, I dare you! ), classroom use, or hilarious one-on-one reading. Recommended. This is just for me. 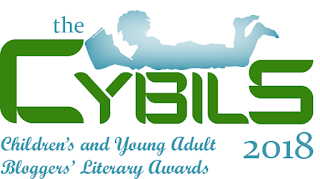 Our new social media guru/literacy evangelist (who once upon a time was chair of the easy reader/early chapter category), Terry Doherty, is making all sorts of coolness happen this year, including a Goodreads group for Cybils. I'm working on adding our finalists and winners to the bookshelf and it's hard to do for nonfiction because the category has shifted over the years. So I made myself a timeline and in case you're as obsessive about data (and clueless about time math) I thought you might enjoy it. Fiona Bayrock is the first category organizer for Non-Fiction Picture Books - Winner - Egg is quiet. I realized that this category didn't necessarily work well as a format (like graphic novels or easy readers) and switched to audience instead. 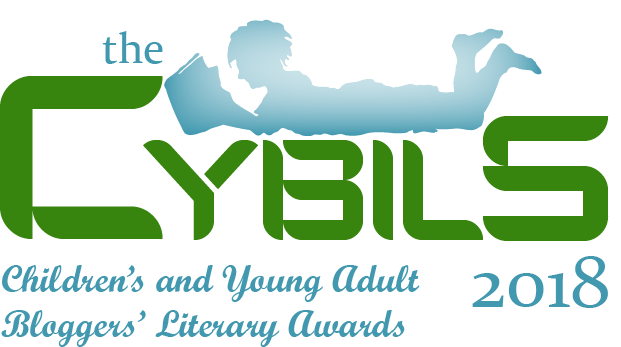 We still only had one winner, like Elementary/Middle Grade Speculative Fiction (it was Fantasy back then!) and the winner this year was Look up! Bird-watching in your own backyard by Cate. Changing from format to audience had worked well, but I felt the middle grade titles were getting neglected in favor of the younger, elementary titles. I had originally intended to just split what I already had, but the teen nonfiction category was interested in splitting also and I gave them the middle grade name, taking "juvenile" for my upper grades. A new organizer had taken over the teen nonfiction and graciously returned the middle grade notation to me, as we discussed what changes we wanted to make for the coming year. I (hope) this will be the way things go for quite a while! My dahlias are doing pretty well! School started on Tuesday and it was a day of beginnings for us as well - new aide and teen services intern also started on Tuesday. The parking lot is fully under construction. Finishing summer reports and planning for outreach visits, training new staff, and other stuff. I am not even going to think about the state I left my desk in. It's bad. I really disliked the first book in this series, Cosmic Commandos, because of how unpleasant the characters were. However, fortunately you don't need to read the first book to follow this second title because I really enjoyed this one! Zoe, a robots genius, loves to watch classic monster movies and hang out with the robot she created. Her parents would like her to make some "real" friends, but the one time she tried, way back in elementary school, it was all a fake. The girl was just pretending to be her friend. Devastated, Zoe refuses to reach out again and isolates herself in her new, high-tech school for gifted kids. Her parents are busy with her triplet brothers and Zoe is all alone, just the way she wants it. But one day, frustrated by her parents and teachers trying to urge her to make friends and secretly lonely, she picks up a ring, wishes the monsters in her movies were real and that night, in the midst of a storm... a real kaiju (monster) shows up at her window! She's finally got a friend, exactly the one she wanted. But things get complicated fast - her new friend Chomp has got family and friends of his own and they're very, very hungry. Can Zoe save the city and her friend on her own? And if she can't, will she be willing to not only ask for help but also trust other people and kids? Zoe, a short black girl with a riot of black curls, stomps through the story in her signature blue overalls and goggles. She would like to have friends, but is too scared to reach out and determined to do everything on her own, without the help of well-meaning adults and the kids she doesn't trust to be sincere in wanting to spend time with her. Her parents are worried about her, but exhausted and preoccupied dealing with rambunctious toddler triplets, shown exuberantly flinging food, dashing through the house naked, and generally created chaos. It's refreshing to see a black girl who is not only interested in but excels in science and technology. Zoe doesn't need a helpful (white) friend to teach her social skills; she's got a kaiju monster and a disaster on her hands that forces her to befriend some of the other kids in school who have already learned to work together; she eventually teams up with her teachers, Mr. Nakajima and Ms. Mahnken, and four kids from school, two white boys and a dark-skinned boy and girl. But in the end, she might need even more help - from her parents? Verdict: This is full of monsters, robots, exciting action, lots of color, a nice environmental twist, and some heart-felt moments of learning to ask for help and open up to friends, even when it might be scary or painful. Sure to be a hit with HiLo fans and kids who love monsters and robots. Warren has a problem. Actually, Warren has a lot of problems. The shy 2nd grader has moved to a new town, is starting 2nd grade in a new school, and has no friends except his toy Dragon. Warren doesn't think he needs any friends besides Dragon, even though his Hobbes-like dragon friend gets him into trouble. But his sister Ellie, popular and outgoing, has challenged him to make 100 new friends. Can Warren make one new friend, let alone one hundred? Light pencil drawings show a worried white boy, his bouncy blond twin, and a snarky, pudgy dragon with a long tongue and a penchant for marshmallows and trouble. Warren slowly becomes friends with the new neighbors, a very different family from their previous neighbor, Ms. Reilly, "an older white woman who didn't have any kids." The new family is black, has two moms, a teen son, a baby girl, and a boy named Michael. Their parents would like Michael and Warren to be friends, but Warren doesn't want to be friends with a little kid - Michael is a whole year younger than him, starting 1st grade. After some disastrous events at school, when Warren takes Dragon's advice and fails to make any friends, he eventually realizes he needs to make some compromises to make friends - and maybe Michael isn't so little after all. While it's nice to see the diversity offered by Michael and his family, it would have been even nicer to see the minority kid as the main character and not, yet again, the sidekick. The story is told completely from Warren's perspective and his often humorous narration shows his imaginative inner life contrasting with his lack of self-confidence both at school and at home. Several blurbs and reviews compare this to Calvin and Hobbes and while the basic idea is the same - a stuffed toy that is "real" only to the boy who plays with him - the execution is worlds apart. Warren is young, not old, for his age and definitely lacks Calvin's gleeful mischief. He's more like the overly anxious and worried Alvin Ho than the gung-ho Calvin. Verdict: A mildly humorous addition if you need more beginning chapter books, but not a necessary purchase. I've only seen Sam Williams as an illustrator, but his cute, sweet illustrations are very attractive so I was interested in picking up this board book series when I happened upon it. "Noah's Park" features a handful of cute little animals in various activities at, you guessed it, a park. There are six characters; a pink-faced piglet, puppy, bear, golden-furred... other bear? I can't decide what that one is. A panda and a fluffy-looking purple snail (yes, it's a fluffy snail. Williams makes it cute, trust me). The opening spread has a layout of the park on the left and a gatefold on the right. The front of the page shows the characters and then folds out to show them all lining up for a boat ride. They put on their "safety vests", collect their lunch boxes, and sail away. There's a scene of feeding ducks, lunch under a striped awning that looks a little like a carousel, and a trip back in the boat. The simple text narrates the events, "Time to go home. Let's clean up and sing a good-bye tune." and the pictures are very cute. There's not much to the plot, but this isn't unusual in a board book. Verdict: A cheerful and colorful addition to your board book collection. Not a necessary purchase, but a good filler. He’s trying to eat a rock. Clearly, there is something wrong. Loudly and enthusiastically (with a few bad jokes) Gertie sets out on her new task, looking forward to earning her Wildlife Buddy Merit Badge. Unfortunately, this bear is really clueless! Even Gertie can’t help him! Or can she? It will take a lot of understanding and some compromise on both sides before they find something for the bear to eat. Cartoon panels follow the goofy storytline, with plenty of disgusted, helpless, and annoyed expressions on the faces of both bear and Gertie as they try to negotiate the woods. Verdict: A funny story that will click with older preschoolers and younger elementary students, especially if they’re learning about what bears eat. This is the first children's book written by scientist Rob Bierregaard, but it's an excellent effort, not dumbing down the material nor making it too fanciful. After an introduction, explaining his work with ospreys, Bierregaard (Dr. B.) tells the story of a young osprey named Belle. After her parents' mate and raise their brood, Belle is tagged by Dr. B. and a colleague with a transmitter. Some local children become interested and follow along on her journey as she slowly explores her world on the coast in Martha's Vineyard and then sets out on her long journey - all the way down to South America. After many adventures, some imagined, some real, Belle arrives at her destination and spends the next few seasons maturing. Finally, she returns to her birthplace and Dr. B. imagines the new family she will raise. Garchinsky's watercolor and crayon illustrations add color and depth to the story, while expanding the imaginative aspect of the tale. Although Dr. B. did not personally see all the events of Belle's journey, as he explains in the introduction, these are things that many migrating ospreys encounter and Belle might be likely to have experienced. The real-life Belle had not yet mated, but the imagined courtship and nest-building is typical of ospreys. The back matter includes a discussion of the anatomy and behavior of ospreys, recommendations for dealing with injured wildlife, and more resources to find out about ospreys and other birds. Verdict: This reminded me somewhat of narrative nonfiction of my youth, following a single animal through a cycle of their life. However, it's thoroughly modern in that it refrains from anthropomorphizing Belle and Bierregaard is clear about which parts of the journey apply to the "real" Belle, which are extrapolated from her transmitter, and which are actual events that happened to her. Readers who enjoy narratives and also have a strong interest in animals will be interested in picking up this book. Hand to fans of Jean Craighead George and Jim Arnosky. No programs or outreach this week. I only have about six hours on the information desk, although many staff are gone on vacation or at outreach for the county fair so I expected (and was not disappointed) to be interrupted frequently. It's all worth it when I can help teachers get the year started with their classrooms looking like this! not ready for browsing yet, so I filled in!